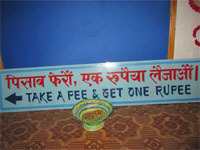 Take a Pee & Get One Rupee. If you have traveled on the Prithvi Highway last year, you must have noticed this seemingly-ridiculous slogan in Darechowk, near Kurintar. Of course, if you have used public toilets before, then you may be more used to paying a rupee to urinate. Instead, members of The Sewa Nepal, a local NGO, pay anyone a rupee if he or she uses their toilet. And no, they are not joking. “Previously, people used to mock us but now they have realized the message we are trying to convey: Urine is a valuable asset,” says Srirendra Shrestha, founder and coordinator of the NGO. Thus, what the NGO does is collect the urine and convert it to fertilizers for the villagers around. A pretty unique business idea, but there’s more to this than just that. The NGO, which is involved in environmental conservation and community sanitation, has actively pursued to make Darechowk a model Village Development Committee (VDC). The group’s efforts finally became successful when Darechowk was declared the 18th Open Defecation Free (ODF) VDC in Chitwan a week ago—thus paving the way for a cleaner, sanitized village. The ODF movement in Nepal has been supported by the Department of Water Supply and Sewerage (DWSS) in coordination with World Health Organization, UNICEF and NGOs like Environment and Public Health Organization (ENPHO). The Sewa Nepal has been the local partner of the movement, providing toilet pans and pipes to individual households in Darechowk. Locals say this is a sanitation movement led by the common people. Thus, among the 1,656 households in the VDC, more than half have a proper toilet. Further, around 770 houses have built an EcoSan (short for ecological sanitation) toilet, the most preferred type as it can collect human waste that can be used as fertiliser. Teachers have played a central role in this movement, which took its current shape after DWSS conducted a School-Led Total Sanitation project in 2006 in the district. The programme stressed on teaching sanitation habits in schools and also held discussions and sanitation awareness campaigns, besides training teachers on the use of various types of toilets. The programme was largely successful; since then 378 community schools and 239 public and private schools in the district have been declared ODF schools. The excitement associated with this movement has spilled over to adjoining VDCs of neighboring districts as well. Villagers from Makwanpur, Gorkha and Dhading are trying to follow the Darechowk model and implement the programme in earnest. However, no municipality has yet been declared ODF in Nepal. In a country where only 27 percent of the population has access to sanitation, this model is proving to be one of the few shining lights. Districts like Jajarkot and Rukum saw the deaths of hundreds last year due to diarrhoea, a disease that could have been prevented had this model been implemented there. The ODF model is not only important for health reasons. There are important sociological impacts that having a private toilet has had in Darechowk. This entry was posted in Economic Benefits, Sanitary Facilities, South Asia and tagged ecological sanitation, fertilisers, Nepal, open defecation-free villages, public toilets, rural sanitation, urine diverting toilets. Bookmark the permalink.